Let’s be honest, the middle of the school year can feel a lot like getting lost. We enter September (or August) with a set of plans. We map out our course on curriculum maps, anchor charts and in Google Classroom. We decide where we and our students need to go, what road to take and the stops we need to make on the way. Then the students show up, and teaching becomes more like off-roading. The course we mapped out is suddenly full of detours. We decide in the moment if we turn right or left, and sometimes we lose sight of the road ahead of us. By the time we hit January, we are on an entirely different route than planned. Rather than restart the journey, we have to continue down the road we started. But, that doesn’t mean we can’t recalculate our route and use a different set of directions. Here are seven small teacher-suggested shifts to consider as you get back on track in your teaching for 2018. 1. If your plan for the year was to set clear expectations: consider asking instead of telling. If you feel like your students aren’t meeting expectations, it may be helpful to put on the brakes and revisit them. 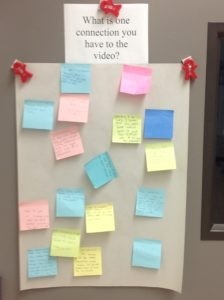 Rather than creating a revised set of expectations and posting them on the classroom wall, consider asking students for feedback. Ask them questions like: What do you feel we do well as a class? What might we need to work on? What do you need from me? What do you need from each other? Inviting students into the process shows them that you value their voices and their input. Rather than telling your students what they are going to do and how they are going to do it, consider asking them and beginning the process with a conversation. 2. If your plan for the year was for students to be active participants in their learning: consider less teacher talk and more student talk. When the room gets quiet, it can be tempting to fill the silence with your voice. Incorporate wait time into your teaching practices. Give students Post-it® Notes and — after you ask a question — provide time for everyone to write down their thoughts before you call on anyone. Consider using Fair Sticks (write each student’s name on a popsicle stick), and pull them out of a jar to ensure equitable participation in your classroom. Try a backchannel like Today's Meet or setting up a Parking Lot. These strategies provide a space for students to share without speaking up and allow the conversation to keep going even after the class ends. 3. If your plan for the year was to receive feedback on your teaching: consider giving yourself more glows than grows. Asking your students for feedback can seem daunting. What if the feedback isn’t positive? Receiving feedback from colleagues and administrators can also be nerve-wracking. However, it is important to open your classroom door in order not to feel isolated in this work. 4. If your plan for the year was to integrate meaningful technology into your classroom: consider using the SAMR model to evaluate your tools. Making the shift to a blended classroom is a big change for both you and your students. If you are beginning to incorporate more technology into your classroom, it can feel overwhelming. There are so many tools. Try using the SAMR model to do an inventory of the tools you used during the first half of the school year. This model helps you assess if a tool is a substitution or if it is augmenting students’ learning and providing an experience that wouldn’t be possible without technology. For example, if you are using Google Forms instead of Exit Tickets to assess your students, what does the form offer that the paper ticket doesn’t? Asking questions like these can help you ensure that your integration of technology is meaningful. SMART goal sentence frame used by Courtney, a fourth grade teacher in North Carolina. 5. If your plan for the year was to support your students to set goals and reflect on their progress: consider using the SMART framework. In my experience, when students are asked to write a goal, they generate a vague response like I want to be better at math, I will study more, or I will do my homework. While this can serve as a starting point, it is difficult for students to know what to do in order to work toward their goals. If you want to prioritize goal setting in your classroom, consider introducing students to the SMART framework and creating a class goal. Set a reminder each week in your calendar to check in with students on their progress. Providing them with an accountability partner and talking stems can support them to receive feedback around their goal setting. 6. If your plan for the year was to provide students with opportunities for choice in your classroom: consider trying a mini-choice board. Many students’ school experience is that the teacher tells them what they need to learn, they memorize it, and then they take a test. Fortunately, this story is being re-written as many teachers emphasize student choice in their classrooms. At first, students may be uncomfortable choosing how they want to learn and demonstrate their understanding. Starting with a mini-choice board can provide opportunities for choice but on a smaller more digestible scale. 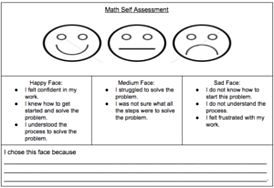 Math Self-Assessment Exit Ticket used by Shannon, a fourth grade teacher in Texas. 7. If your plan for the year was to support students to self-assess, try incorporating self-assessment into your classroom routine. If an Exit Ticket is already part of your class structure, consider providing students with an opportunity to self-assess the work they did in class that day. Often, students don’t have the vocabulary to explain their choice. I find that a helpful scaffold is to provide a word bank of sentences so that students can more clearly explain what they chose and why. This information can then be used to strategically group students and/or guide your next instructional move. Whether you had taken a few wrong turns or were out in the middle of nowhere, these strategies will help you get back on course and make 2018 one of your best years yet.